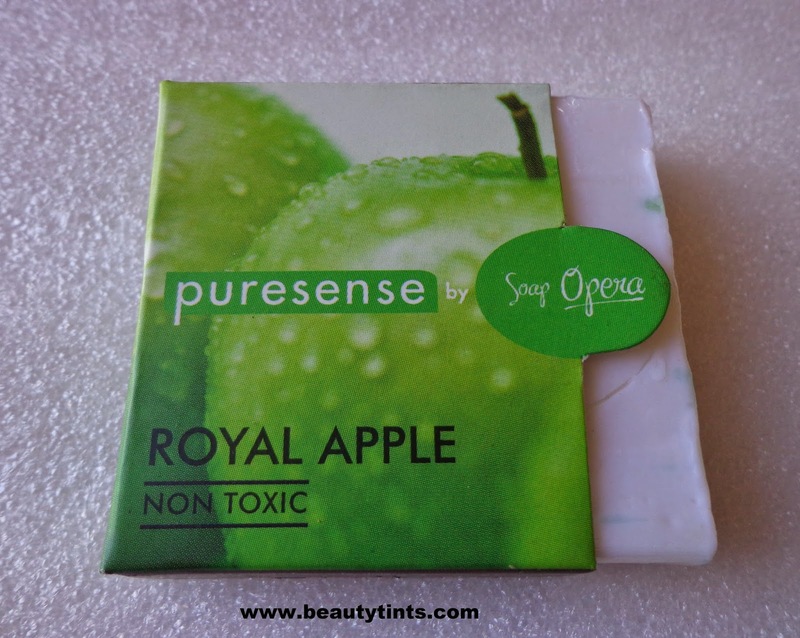 Today I am reviewing Pure Sense by Soap Opera Royal Apple Soap ,which is one of the variants in the set of soaps I received recently.You can check out the other variants in my first impression post here. 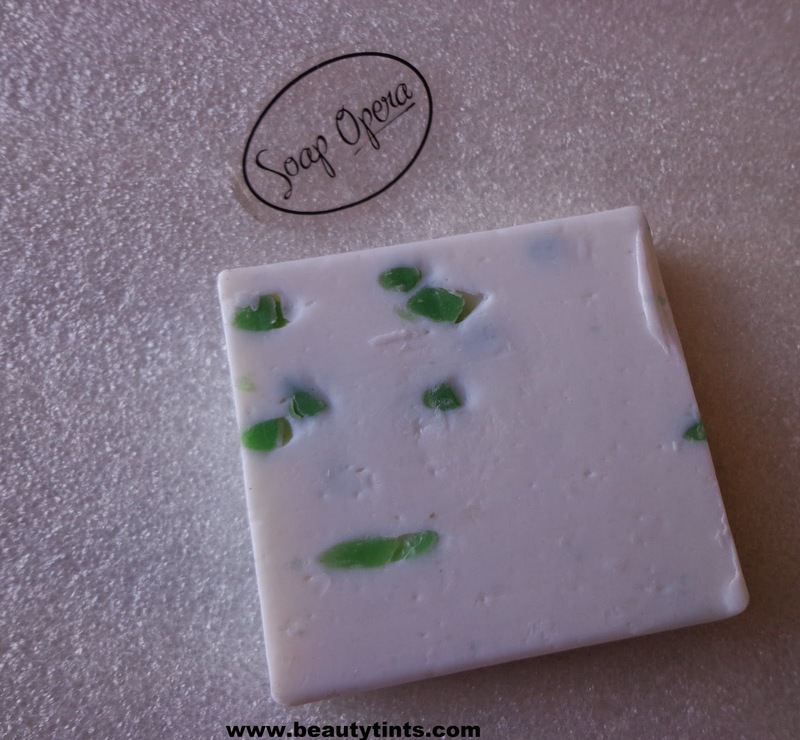 Color and Texture : This is a white colored soap with bright green colored pieces embedded in it. What the product Claims : Green apples contain skin-friendly nutrients, including vitamin C and copper leaving your skin healthy, soft and glowing. 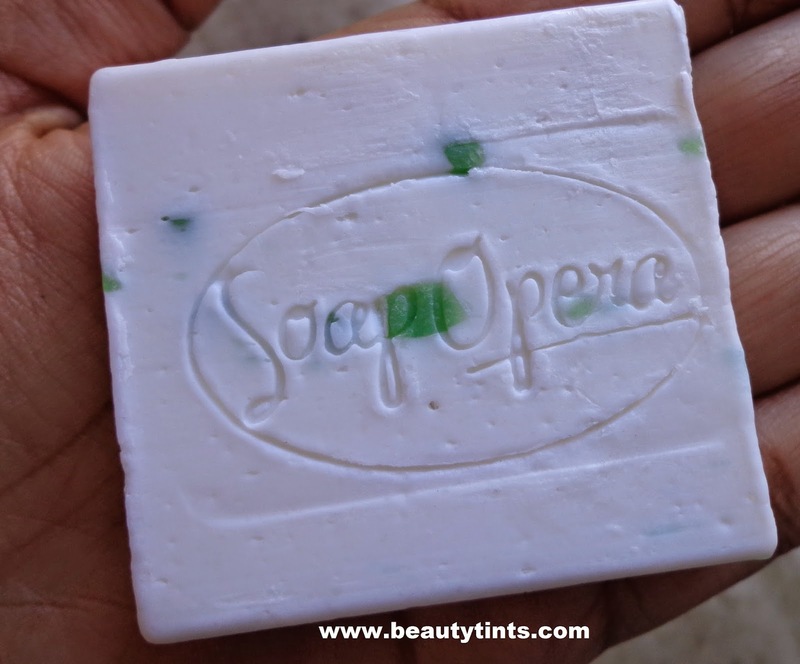 The olive oil provides extra nourishment to your skin. 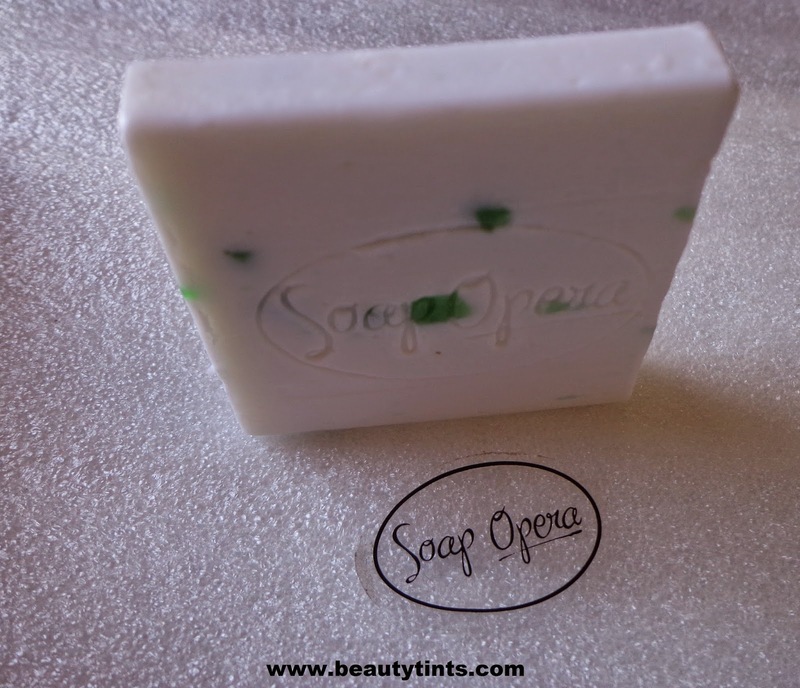 This bar of soap is free of sulphates, parabens, formaldehydes and non-carcinogenic. 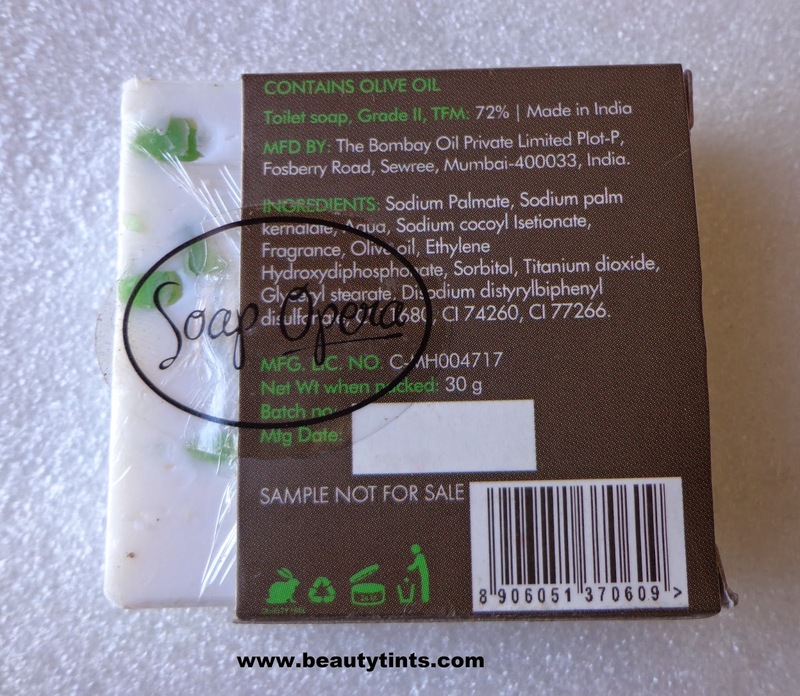 Ingredients : Sodium Palmate,Sodium Palm Kernalate,Aqua,Sodium Cocoyl Isetionate,Fragrance,Olive Oil,Ethylene Hydroxy diphosphonate Sorbitol,Titanium dioxide,Glyceryl stearate,Disodium distyrylbiphenyl di sulfonate,CI 11680,CI 74260, CI 77266. 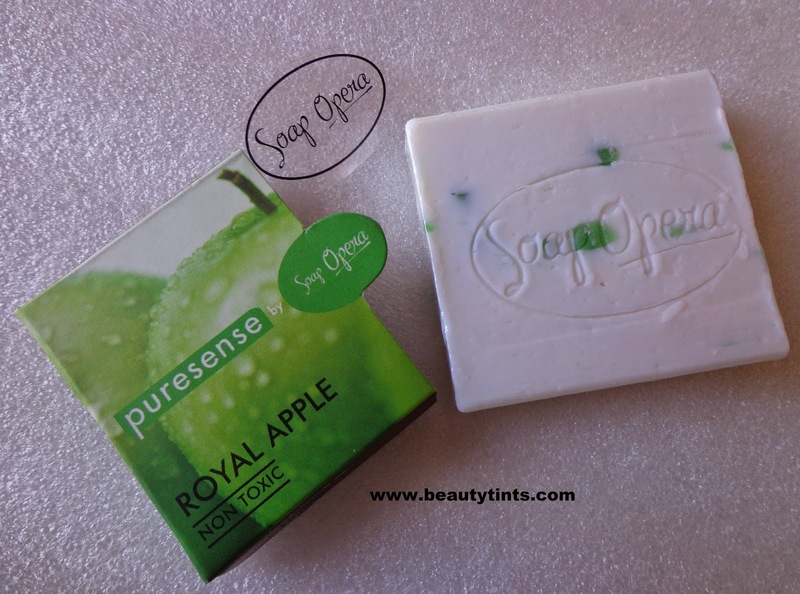 My Views On the Product : It is a 30 gm sample which lasts only for 1-2 weeks.It comes in a very classy packaging similar to the full sized product.The soap has the imprint of the Soap Opera name on it.This particular Royal Apple variant is from their fruity soaps range and it has a refreshing green apple fragrance which stays for more than 2 hours.This is a creamy soap which lathers very well and cleanses the skin very well in a gentle way.It does not melt easily.It is very moisturizing on the skin and does not dry out the skin.I enjoyed using each and every bit of it.It contains the goodness of green apple extracts and olive oil.It is quite affordable and is priced at INR 99 for 100 gm.All soap opera soaps are paraben free and Non-Carcinogenic. Also check out the Pure sense Sleep Inducer review here. It is moisturizing enough for normal skin. 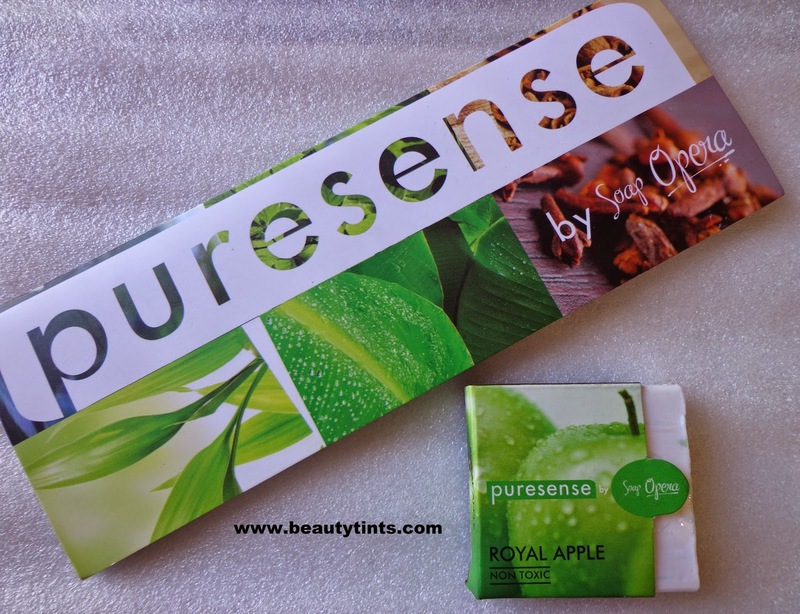 Final Conclusion about Pure Sense by Soap Opera Royal Apple Soap :It cleanses the skin very well and is very gentle on skin.It is very affordable compared to many organic soaps.It has a refreshing green apple fragrance and is moisturizing enough for normal skin.Those who love fruity flavors should definitely give this a try.